In the umbrella term contemporary dance, the word ‘contemporary’ usually refers only to the movement aesthetic, and rarely indicates if the work’s subject is reflective of contemporary life at all. 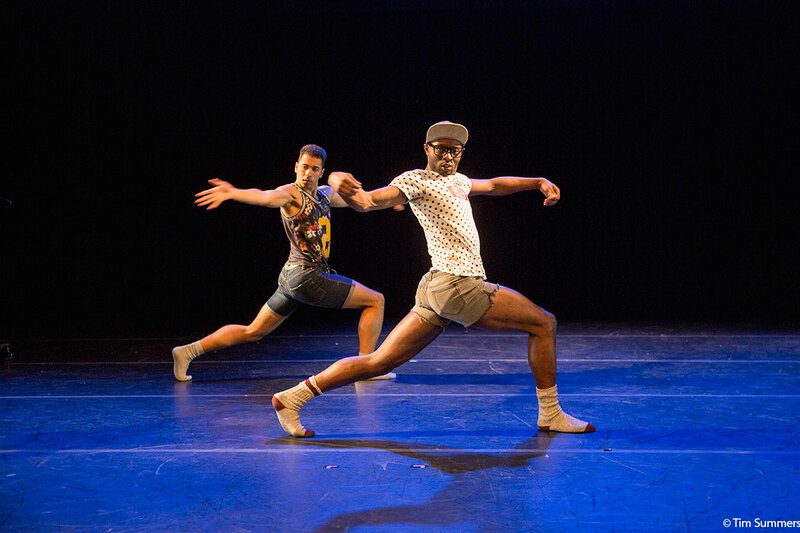 A considerable exception to this was the recent performance of Showing Out: Contemporary Black Choreographers at Velocity Dance Center, March 4-5. The program felt contemporary in every sense of the word. It featured current movement aesthetics and layered multimedia experiences, but, more compellingly, it added to the ongoing cultural discourse with its portrayal of black identity and the continued struggle for equality. Curated by Spectrum Dance Theater’s Donald Byrd and co-presented by Velocity and the Central District Forum for Arts & Ideas, the program featured five local black choreographers: Maxie Jamal, Alex Crozier, Jade Solomon Curtis, Randy Ford, and Dani Tirrell, who was also the production manager and led a post show discussion. Ford and Tirrell’s works both dove into the experience of being black and gay. In Mama can I be a Princess Too? #forlittleblackboys Tirrell appeared in a long pink flowery skirt and a crown of pink flowers; when he stepped onto a chair, he seemed an ascendent goddess. Assisted by video projections of him alternately walking deserted city streets in a hoodie and wearing the pink outfit in a garden, he communicated both his claim to femininity and the struggle to reconcile that claim with expectations placed upon black masculinity. 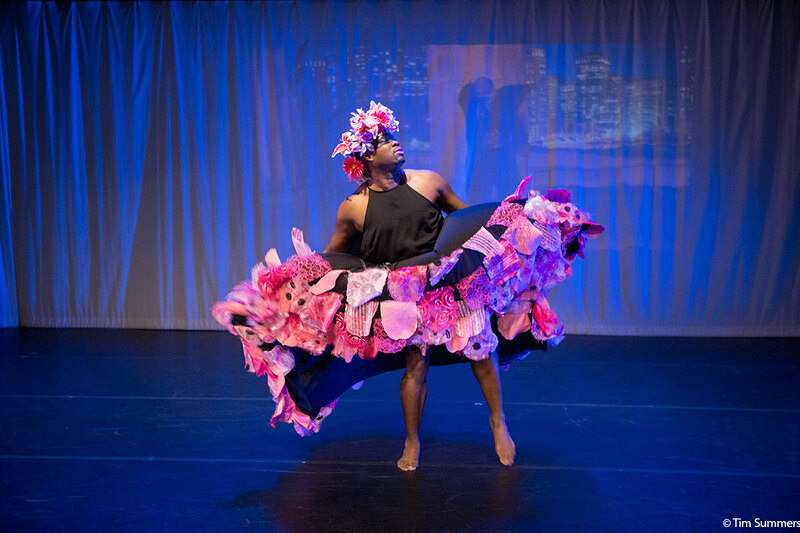 Ford’s The New Masculine, a duet featuring himself and Fausto Rivera, integrated voguing and hip hop vocabulary with modern dance motifs. In one section, Rivera repeated short phrases—“You sound like a girl,” “You can’t say cute,” and several in Spanish—to accompanying gestures that made it clear that being gay wasn’t always a welcome part of life. At one point Ford mirrored the gestures behind Rivera before the two broke into movement phrases that blended masculine and feminine qualities. Ford showcased particular fierceness by dancing the second half of the work in outlandishly tall high heels. The Bliss of Innocence, choreographed by Jamal, seemed to tell a story within a story and was clearly an excerpt of a larger work. With a woman asleep on a cot in an upstage corner, the scene, which included a sultry nightclub performance, may have been all a dream. 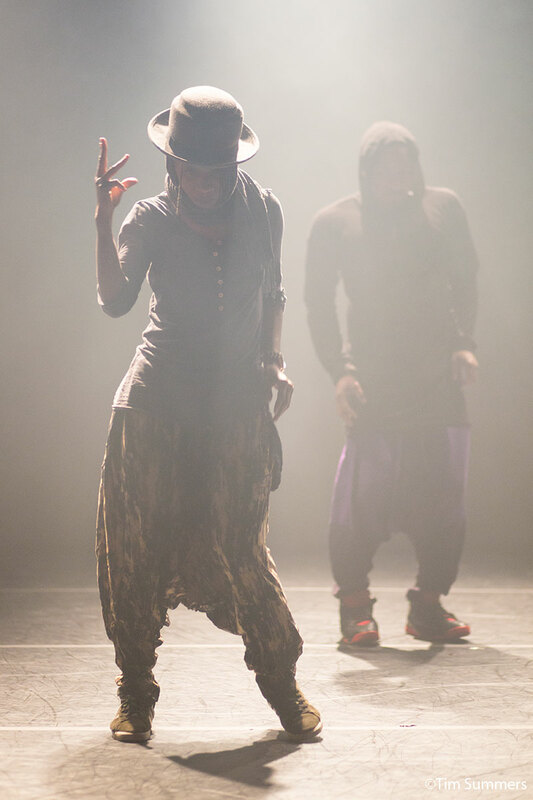 A duet by Jamal and Albedo Alexander Hobson featured hip hop movement with spot-on musicality, a satisfying visual effect that’s not always utilized in contemporary dance. Whenever her whole work comes to fruition, be sure to go. This snippet was not nearly a large enough of taste of what this choreographer can do. Crozier’s work, Guys, featured fellow Spectrum dancers Davione Gordon and Alexis “Tilly” Evans-Krueger. They changed clothes repeatedly throughout the performance, starting in casual hipster attire and ending with the men in suits and Evans-Krueger in a slinky red shirt and black leggings. Though several sections lasted a tad longer than necessary, riveting moments included the opening male duet’s seamless medley of dance aesthetics, as well as Evans-Krueger’s solo. In a phenomenal display of body control, she pointed at successive body parts to command them to move, accelerating the tempo until she became a whirlwind of gyrations and pulses. The evening’s standout, however, was the closing work choreographed and performed by Jade Solomon Curtis. Segmented into vignettes and interspersed with audio recordings of civil rights speeches, Black Like Me featured various archetypes of black identity. In one, she was an empowered seductress dancing on a stool; in another she ran in a wide circle and collapsed to the floor at the sound of a gunshot; and in another she played the tough guy with hard-hitting movement in a black leather jacket. The final section felt most authentic; in a white jacket she seemed to embody both hope for the future and grace through difficulty. She is a riveting performer (as anyone who saw her when she was with Spectrum can attest), but in her own work, her terrific facility coalesced with her unique artist’s voice to transfixing effect. Though each piece featured the individual choreographer’s distinct voice, it was the program as a whole that spoke the loudest. 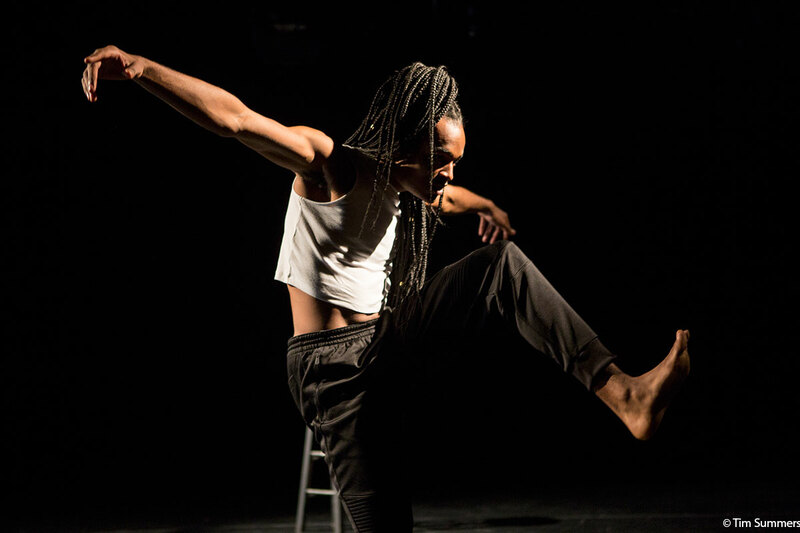 Putting this array of works on a bill together offered overwhelming proof (though it’s an unfortunate fact that this needs to be proven today at all) that blackness encompasses a spectrum of experience that can and should be explored through dance. The whole program had a sense of urgency; the subject matter was real and relevant, and, in the hands of these skilled choreographers, was clearly communicated. In the post show discussion, many audience members (it was a noticeably diverse crowd for Seattle dance), noted that this was their first dance performance and that they were taken aback by how much it resonated with them. At a time when contemporary dance can feel like an insiders club, we need these voices more than ever to show that dance can be a relevant player in the larger cultural discussion. More information about programs at Velocity Dance Center can be found at their website. Additional information about Central District Forum for Arts & Ideas can be found HERE.